St. Paul’s placed three players among the top seven individuals, including runner-up John Gaal (R), and claimed its first tournament title of the year. OXFORD — Jacob LeCroy’s golf ball ran out of gas on the 17th hole, so he did what any sensible driver would do. He pulled in for a fill up. The Donoho senior changed out the balky and damaged ball on the 18th tee and, now fueled to the max, he rode it all the way to the finish line. He made clutch putts with the new Titleist on each of his final two greens, making birdie on 18 after finding the hazard off the tee to take the lead and sinking a tense six-footer at the last for par, to avoid a playoff and win the medalist honors in the Oxford Invitational that got away from him last year by one stroke. LeCroy shot a final-round 2-under-par 70 to finish at 1-over 145 for the tournament. St. Paul’s junior John Gaal shot the round of the day, 69, and finished one shot back. Defending champion and Alabama signee Tyler Lipscomb of Bremen (Ga.) was third at 148 after a final-round 70. At separate points on the back nine LeCroy was tied with each of his challengers for the lead. He was tied with Gaal until the birdie at 18. He entered the day with a two-shot lead. Lipscomb earned a piece of the lead when he went eagle-birdie-birdie on 9, 10 and 11 to get to 4-under for the day, and briefly held the lead when LeCroy bogeyed 12, but fell back with bogey on 14 and bogeyed 18 to finish. That left it to LeCroy and Gaal to battle coming home. Gaal grabbed his share of the lead with an eagle on 15 to LeCroy’s par and the game was on. LeCroy missed putts on the high side on 15, 16 and 17 that would have allowed him to pull away. Instead they were tied going to 18. LeCroy found the hazard off the tee, but wound up making a straight five-foot birdie to take the lead. Finishing on 1, Gaal hit it to 10 feet and LeCroy to 20. Gaal just missed his birdie putt and LeCroy ran his six feet past but courageously made it coming back. The team race wasn’t so close. 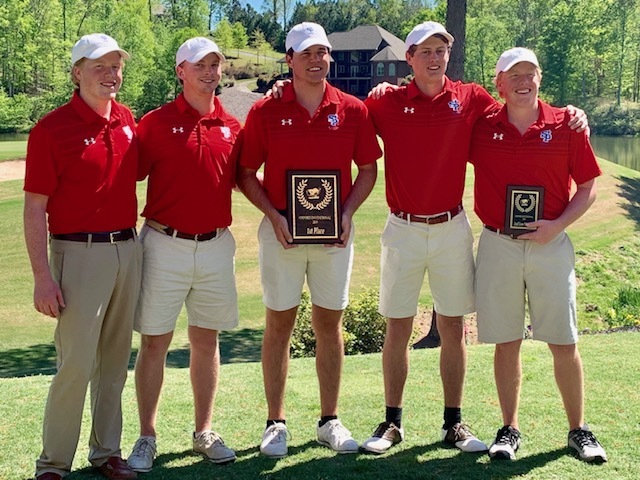 Three-time reigning 5A state champion St. Paul’s posted a 304 Tuesday and won its first tournament of the year by 25 shots over James Clemens. In addition to Gaal, the Saints put two other players in the top seven and all five in the top 17. Clemens’ top two players finished tied for ninth and a third was T-12. The Saints were second in each of their last two tournaments against fields that included multiple state champions. They were playing in the tournament to get an advanced look at Cider Ridge, the site of their sub-state qualifier in three weeks. ONEONTA – White Plains made a 19-shot improvement over the opening round and jumped three spots to finish tied for 11thin the Tom Bell Memorial Classic at Limestone Springs. The Wildcats, who had only one round in the 70s on Monday, had all four counters score in the 70s Tuesday and they posted a 300 to finish at 619 and tied with Brooks. Andrew Miller shot even-par 72 to lead the Wildcats for the second day in a row. He finished at 5-over 149 for the tournament, T-29 individually. The Wildcats also counted 74 from Kenny Okins, 75 from Gage Miller and 79 from Gavin Burrage. Mountain Brook won the tournament at 11-under 565 (281-284). The Spartans’ William Wann was low medalist with rounds of 67-68. He won by a stroke over Houston Academy’s Hal Dove and two over UMS Wright’s JP Cave. GADSDEN – Lauren Cole shot 44 to win medalist honors and lead the Glencoe girls to victory in a five-team, nine-hole match at Twin Bridges. The Lady Jackets shot to 161 and won the team portion by eight shots over Etowah. Cole’s 44 was four shots better than runner-up Miranda Nassif of Etowah. Glencoe returns to the course Thursday in the Gadsden Area Tournament at Twin Bridges, hosted by the Gadsden Junior Golf Association. Team scores: Glencoe 161, Etowah 169, Hokes Bluff 205. Individual top 5: Lauren Cole, Glencoe 44; Miranda Nassif, Etowah 48; Mallory Brooks, Southside 54; Abigail Lee, Springville 56; Sydney Correll, Etowah 58; Camryn Blackwell, Glencoe 58.